I always struggle with what to do with photo Christmas cards after the season is over. Because of the holiday messages, they aren't great for displaying year-round. This year, I came up with an idea: a reverse picture frame. I call it a reverse picture frame because the photos are ON the frame rather than IN the frame. Start by painting the frame black. I only painted the front and sides, which is fine if you're going to display the frame against a wall. Paint the back also if you'll be putting the frame on a tabletop where the back is visible. When the paint is dry, arrange the photos to fit on the wood part of the frame. It's OK if part of a photo hangs over into the opening as long as the faces are not going to be cut off. When you're happy with how they look, adhere them lightly to the frame. Use repositionable tape or a small amount of permanent tape. As you can see, I added a small rectangle to the right of the heart to hold the space for where I'd write the date. Turn the frame upside down. Use a Sharpie to trace the shape of the cut-out heart. Turn the frame right-side up. 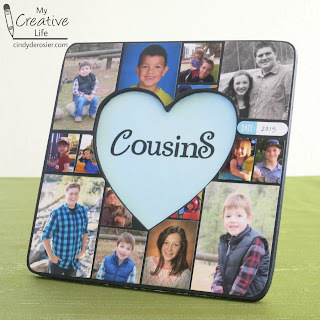 Remove each photo that overlaps into the cut-out heart and trim just inside the Sharpie line. That will leave a tiny border of black on the frame. Use a strong adhesive to secure all photos to the frame. You could use a sealant over the top if you want it to be very durable, but I just left it as is. Cut a piece of cardstock to fit inside the cut-out heart. Add a title with letter stickers, then insert it into the frame. Also I don't do cards...Christmas or otherwise! This is such a neat idea! I love that you repurposed the cards that they sent you. This is so cool! I would love to make one with photos of my best friend and I from over the years. You could do this so many ways. I just stumbled across your site. This is such a wonderful idea! You are so creative. 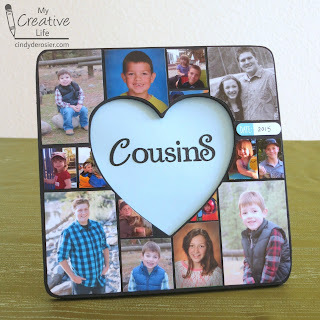 I invite you to share this idea at my Party in Your PJs link party on my website Grandma Ideas http://grandmaideas.com. (You can share a couple of other ideas, too!) It's open through midnight Mountain Standard time on Sunday. I hope you can make it!